- ShoutBox (see below, or in french). - Option _GROUP_FOR_ADMIN_MESSAGES renowned in _GROUP_FOR_SBX_AND_ADMIN_MSG ! 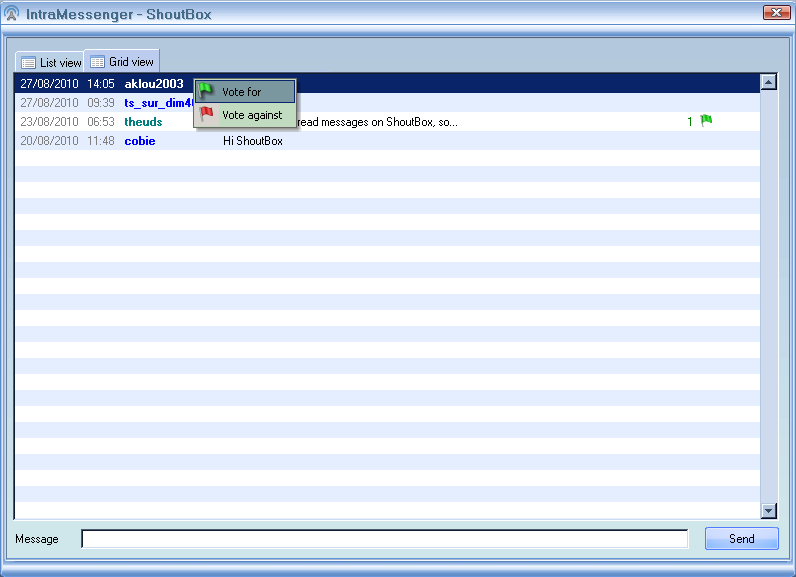 Allow use groups for ShoutBox to. .. Active this option, add 3 level groups : publics - officials - privates. .. Users can register to publics and groups, and request to register on officials groups. 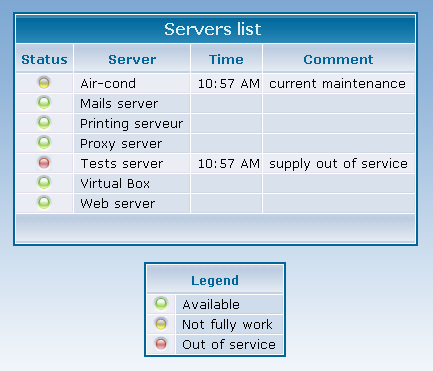 - Option to manage servers status : see below. - Select style (ACP) (demo). - Add-on SypexDumper to backup/restore. - Option : password must contain : letters AND digits (at least one of each). - Option : password must contain : uppercase AND lower case (at least one of each). - Option : password must contain : special characters (at least one of each). - Bug fix : midnight reboot. - Session list : legend : second column (total all pages). 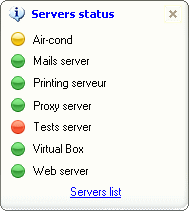 - Options list : small symbol to indicate the options bad parameterized to internet IM server book address. 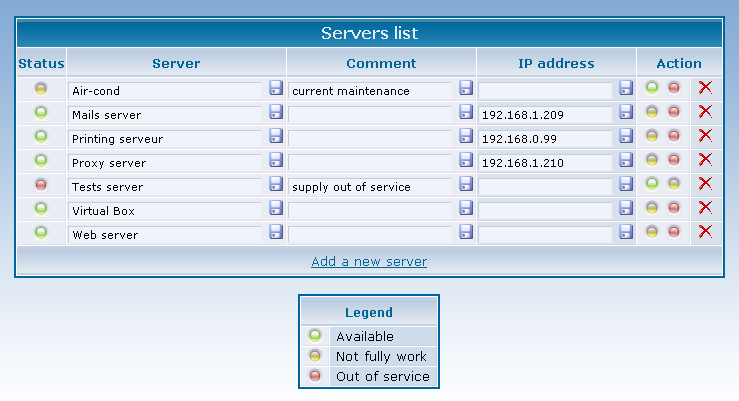 - Register to internet IM server book address from ACP. - Date last password change. - Date last activity (last send/received message, add/remove contact). - Preventing duplicate messages pending consultation admin (on logon). - Preventing duplicate messages admin (to admin). - External auth with Joomla : notify private message arrival. - Folder /distant/ no longer contains the old files php (for client version < 1.02) (replaced by the sub-folder /distant/include/). - Proposal avatar : filename length check before transferring. - Updates on group managing area. Changing time (incident) is displayed with your eventual comment. delete unwanted messages one by one, puis validation générale des autres (ceux à publier). - If votes are authorized, average displayed (on the right). 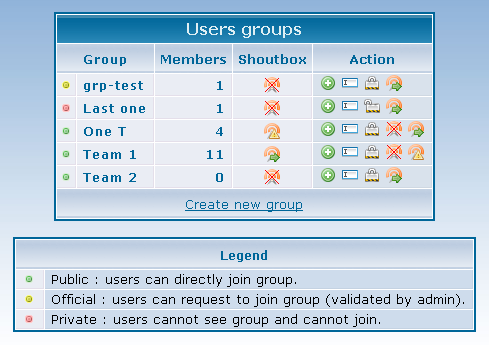 You allow ShoutBox or not for each group. - Users list : last password changing date. 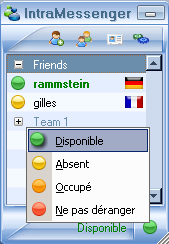 - Users list and sessions liste : last activity date. - Spanish translation (thanks to Jose Carlos Castelo Rojano). - With fix en top menu (following language). - Fix "Connections (days)" : different days number (not opened sessions). - Password date on account create (if not empty) instead of date last changed (empty if never changed). 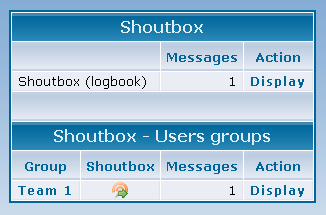 - ShoutBox : Weekly messages quota per user : need MySQL 5. - New extern authentication possibility: Chamilo, ATutor, osCMax, Mahara, SimpleGroupware, BeWelcome-Rox, pragmaMx, Textpattern, Zikula. - Can display menu on the right (or left or top). - Options list : can display options names. - On options saving, display that were automatically corrected. Thanks a lot to Roctx for full updating english translation!